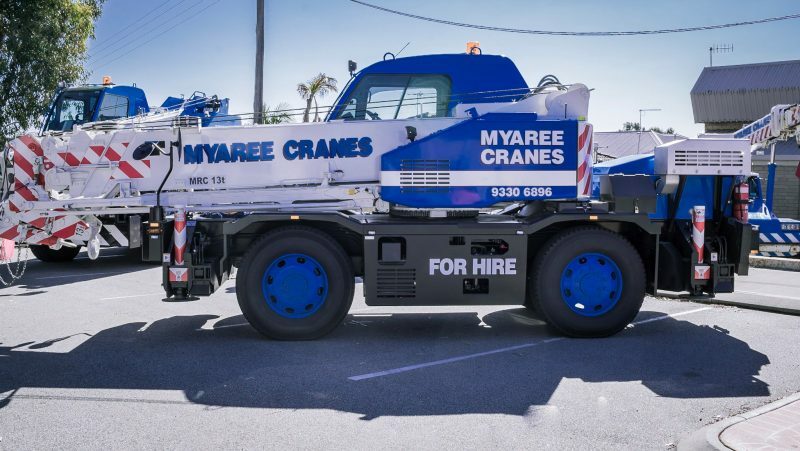 There are not many crane hire companies in Perth that boast a fleet so large, that can provide you with so many lifting solutions as Myaree Crane Hire can. With a fleet consisting of 9 Cranes, Myaree Crane Hire have just secured their 10th Crane. ARRIVING DEC 2018 - BRAND NEW! This New Tadano 20 Metric Ton Crane, has been specifically designed and built for Australian Conditions. Commonly known as a Tom Thumb Crane or City Cranes, this rough terrain crane can access many locations and environments. These cranes make light work even in the must bumpy and ragged terrain. These mini-slewing cranes have the capability to zip in and out of the most awkward and restricted areas, while lifting a heavy load with absolute ease. Tom Thumbs are a smart choice for most commercial, industrial and residential lifting projects. Agile and highly manoeuvrable, they can get into tight spots while lifting bulky furniture and equipment up onto higher floors. Tom Thumbs can be used for dual lifting if the load is too great for a single crane. Out on the construction site, all-terrain city cranes combine the ability to get just about anywhere with the reach to get all your building supplies up onto higher levels. Bricks, Beams, Windows – whatever materials you have on site, we’ll move them quickly, easily, and safely. City cranes also work well in an industrial setting, capable of zipping around restricted workshops and available in a range of capacities depending on the project at hand. Our Tom Thumb cranes are also a common sight in marinas across Perth. Why Choose Myaree Crane Hire? With so many options for crane hires in Perth, why should you place your trust in Myaree? Young crane companies might be full of enthusiasm, but they lack the depth of expertise that can only be gained in the trenches. For more than 30 years, day in and day out, we’ve been helping construction companies, factories, boat owners, house owners and private individuals get heavy objects exactly where they need to be. From installing swimming pools to relocating whole factories, no job is too big or too small. Equally, if you just want a hefty couch lifted onto the second floor of your house, we won’t turn you down. We’ll arrive promptly and get your furniture moved in no time. While we appreciate that speed is off the essence, it’s useless if the job isn’t carried out safely and in full accordance with OHSE regulations 1996. At Myaree, each and every one of our committed and driven and personnel is qualified, experienced, and ready to help in any way they can. If you want a team you can count on not just now, but over the long-term, that’s great news. We want the same for our customers. We’re very confident that once you’ve seen one of our cranes in action, you’ll be back for more the next time you have any heavy lifting needs.